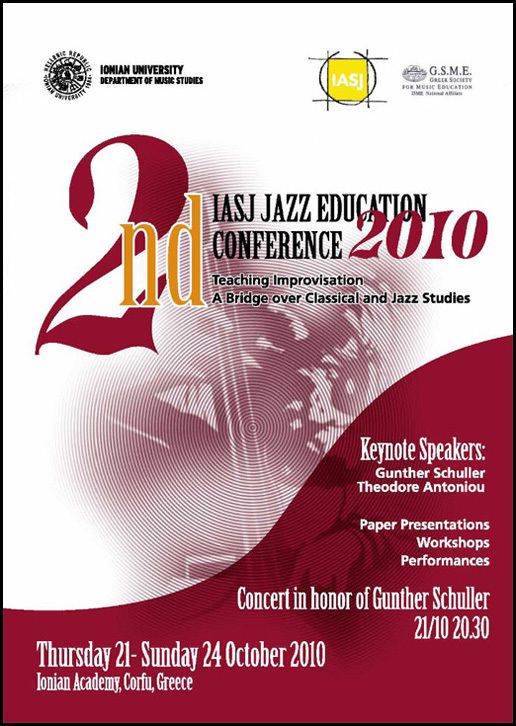 Welcome to the 2nd IASJ Jazz Education Conference. Teaching Improvisation - A Bridge over Classical and Jazz Studies. The 2nd IASJ Jazz Education Conference will take place on the island of Corfu, Greece and will be hosted by the Ionian University Department of Music (http://www.ionio.gr/depts/music) and the Greek Society for Music Education (http://www.eeme.gr). The International Association of Schools of Jazz (IASJ) established in 1989, is the only existing world wide network of schools of jazz. ABSTRACT SUBMISSION DATE JULY 31st 2010. >> NEW! UPDATE! > Conference's Program available here.